This page describes how to do versioning for your API and how to deploy to multiple versions. When you want to introduce an incremental, but non-breaking change, keep the API version constant and deploy over the existing API. When you introduce a breaking change to your API, increment the API version. For additional protection, increment the App Engine application version as well, and then deploy the new API version to that new App Engine application version. This lets you use the built-in flexibility of App Engine to quickly switch between App Engine versions and serve from the old working versions if you run into unexpected problems. The following table is an illustration of cascading backend API versions to different App Engine application versions. As shown in the table, incremental, non-breaking updates to v1 of the API are rolled out, each overwriting the previous version. When breaking changes are introduced, the API version is incremented to v2 and it is deployed to a new App Engine application version. That allows you to switch back to the previous applications version if needed. In the table, notice that application version 2 supports both the latest v1 version and the new v2 version of your API. If you don't delete the existing v1 code from your project, when you deploy the project both v2 and vl (n) of your API are deployed to version 2 of your application. When you deploy your backend API, you deploy it to the project ID of the Google Cloud Platform (GCP) project you created for your API, and you must also specify the App Engine version you deploy to. You specify the App Engine app version in the <version> element of the /WEB-INF/appengine-web.xml file. The App Engine app version isn't the same thing as the backend API version number, which you specify in the version attribute of the @Api annotation. 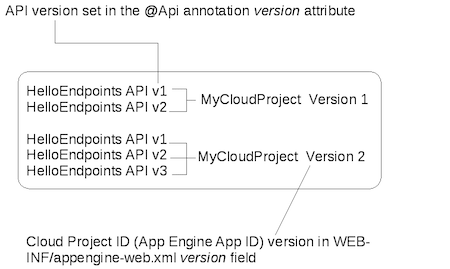 As shown in the preceding figure, you can deploy multiple API versions to the same App Engine version. And, you can have many App Engine versions for an application. The first App Engine version that you deploy your API to is the serving version. This version runs at the URL http://YOUR_PROJECT_ID.appspot.com where YOUR_PROJECT_ID represents your GCP project ID. You can access all of the API versions deployed to that App Engine application version by using that URL. The serving version remains the same until you explicitly change it, in the Google Cloud Platform Console. Replace VERSION with your App Engine version, and YOUR_PROJECT_ID with your GCP project ID. For example, suppose your App Engine serving version is 1, but you want to access an API version deployed to version 2. You would use this URL: https://2-dot-YOUR_PROJECT_ID.appspot.com. Important: For backend APIs, only host names formed using -dot- in place of literal periods work for versioned apps. For more details, see the App Engine documentation.